May music begins May 3 at 7:00 p.m. with an Elizabeth May Memorial Concert by the Children's Chorus of Greater North Texas. 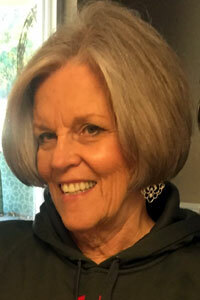 The choir's director Heidi Scheibmeir is Elizabeth's granddaughter. We are thrilled to have the group performing to kick off May Music at the Creative Arts Center! The Children's Chorus of Greater North Texas is a community choir made up of singers in Grayson, Fannin, and Collin counties who are in 3rd through 12th grade. The Fannin County Relay For Life is painting with a twist! 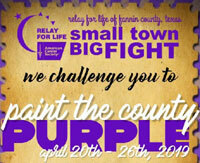 As you know, our Relay is April 27 and our challenge is to "Paint the County PURPLE!" from April 20 through April 27. Easter, also called Pascha or Resurrection Sunday, is a festival and holiday commemorating the resurrection of Jesus from the dead, described in the New Testament as having occurred on the third day after his burial following his crucifixion by the Romans at Calvary c. 30 AD. It is the culmination of the Passion of Jesus, preceded by Lent (or Great Lent), a 40-day period of fasting, prayer, and penance. 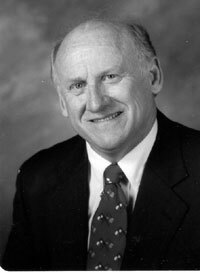 Most Christians refer to the week before Easter as "Holy Week," which contains the days of the Easter Triduum, including Maundy Thursday, commemorating the Maundy and Last Supper, as well as Good Friday, commemorating the crucifixion and death of Jesus.